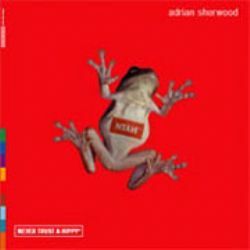 It’s hard to think of this as Adrian Sherwood’s first album under his own name, since he’s been so prominent on many other discs. But for his solo debut, he pushes things all the way to the edge and over. He does let the tension build through the album, hinting at the madness on “Paradise of Nada Remix” before unleashing it with “Processed World” and “The Ignorant Version,” where Sherwood’s daughters sing a nursery rhyme, the bass kicks you hard, and the beat demolishes your mind. There are plenty of the usual Sherwood suspects on hand, but also some surprises, like Sly & Robbie, who lend their inimitable drum and bass talents to a couple of tracks, or the late palm wine singer S.E. Rogie, who appears on “Dead Man Smoking” with Ghetto Priest, while the deep qawwali voices of Rizwam-Muazzam Qawwali suffuse “Paradise of Nada Remix.” It’s a success because Sherwood has deliberately placed no limits on the sound. With only himself to please, he’s taken it all the way, with some sci-fi dancehall dub that seems to be from another world entirely.